A primary school pupil was rushed to hospital after a large chunk of a playground mural collapsed on top of him. 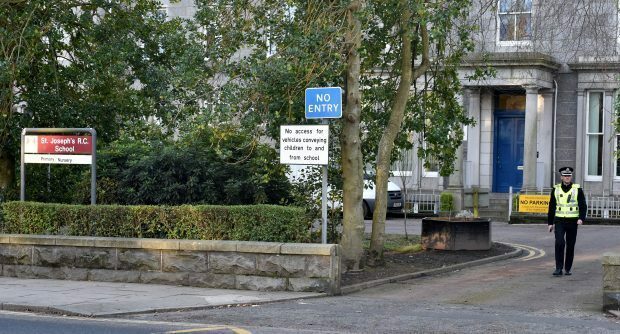 Ambulance, fire and police teams were sent to St Joseph’s on Queen’s Road, Aberdeen shortly before 9am yesterday after receiving reports that a section of wall had fallen on an 11-year-old boy. He was taken to Aberdeen Royal Infirmary with an ankle injury. Aberdeen City Council, alongside police officers and the Health and Safety Executive, are now investigating the incident and could yesterday be seen inspecting the scene of the incident. Queens Cross councillors Martin Greig and John Cooke urged the council to make sure the issue that caused the mural to break isn’t widespread. Mr Greig said: “We need to know if this was an isolated problem, or if there are other parts of the school infrastructure that are at risk. Following the incident, the colourful mural adorning the wall at St Joseph’s was left with a gaping hole several feet wide. A spokesman for the city council last night said: “Staff at the school have been liaising with the pupil’s family and will continue to receive updates. “The best wishes of all at St Joseph’s have been passed to the pupil.